It happens that many people turn their attention toward working with their data at the end of the year. Whether it's fiscal, calendar, academic or otherwise, the point is -- that's when they spend time and energy focused on the data that's been collected. They look at what they've gathered and begin to pull together what they've collected for reporting. We propose that you take some time to consider your data at the beginning versus at the end. In this issue of SpringyNews, we argue that what you don't know now ...could cost you some headaches or even missed opportunities, data-wise, in the long run. As you're working with your Springshare tools, think about what kind of data you want or need to have available to you later and build that in today. Here are some tips for new possibilities in reports, tagging, statistics and more. LibStaffer - Efficiency is Paramount! LibStaffer has benefited from recent improvements to the Auto Scheduler and to site navigation. But we also thought about your reports. The Right Combination - The LibStaffer reports for Pending Swaps and for Given Up Shifts have now been combined. It's now easier to see the complete picture of shifts needing coverage all in one screen. LibCal has had a lot of public-facing improvements this year including the new Calendar Events Card View and the newly redesigned Appointments module. But we know how important it is to make workflows smoother with internal updates, too. Win At This Game of Tag - This is a perfect example of thinking now about what you want to extrapolate later. Put a little work in today by coming up with some Internal Tags that you want to use to keep track of/classify events. These are private and aren't visible to the public. Use tags like Patron Suggested or Pilot Program or Funded by STEM Grants, etc. Filter all statistical reports by these parameters! In this Summer's SpringyCamp sessions, we learned from the Resource Management Unit at the University of Tennessee - Knoxville that they -- much like the folks at Georgia Southern University that looked at improving troubleshooting with LibAnswers -- were interested in using LibAnswers to improve their service and efficiency. Their larger intent included being the architects for a future opportunity for better tracking and statistical reports. They merged all their E-Journals, Databases & E-Books, EZ proxy-related, and discovery layer tickets into The LibAnswers Platform and used LibAnswers Ticket Tagging for data mining purposes. THAT'S The Ticket - Tagging your tickets in LibAnswers allows you to organize and categorize those tickets. Search and browse tickets via those tags, create dashboard views for specific types of tickets, and filter your statistics for focused analysis. LibWizard has four useful components that are designed for easy set-up. Do a bit of building now and then use those Forms, Surveys, Quizzes, and Tutorials over and over again. 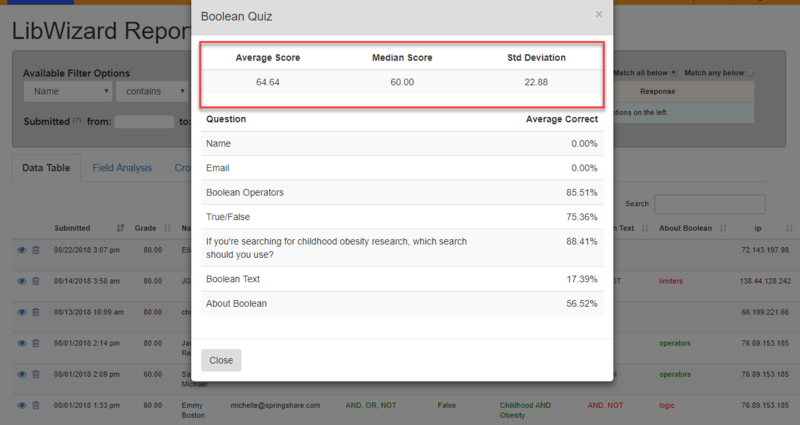 See One, Then See All - LibWizard allows you to see the individual scores for a Quiz or Tutorial submission. However, on occasion, it's important to see how everyone did on the Quiz/Tutorial - so you can also see the overall grade statistics for all submissions. You'll get the average score, median, and even standard deviation for a more complete picture. This bird's eye view delivers aggregate stats to better inform your instruction session deliverables. If your goals include making more data-driven decisions in the years to come, LibInsight is the next step for your library. Not only can you put all of your data into one system so that you can look for cross-dataset correlations, but we've made harvesting that data even easier for you. 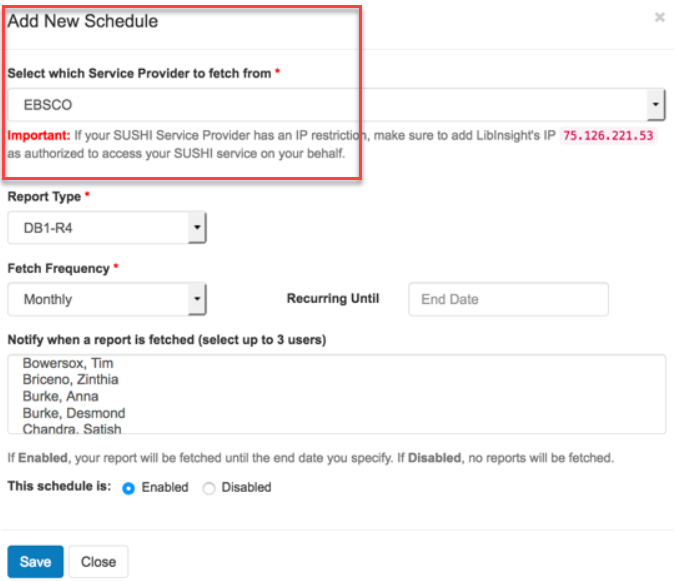 Set Up SUSHI Scheduling - Schedule the automatic harvesting of SUSHI supported reports right into LibInsight. Schedule the auto-retrieve monthly, quarterly, semi-annually, or annually for your E-Journals/Databases or E-Books datasets. You'll even be notified via e-mail upon success or failure of the auto-harvest.